There are not many children's books that I would qualify as artistic. Sure, there are plenty whose illustrations are simply lovely, but I'm not pulling them out for top placement on my coffee table. I don't even own a coffee table. And for that I blame Baby S' toys, but I digress... because if and when I ever do own one again, ABC NYC will be on it! I absolutely love this book and think it's just as much for adults as it is for kids. Dugan's photos showcase letters that are as vibrant as they are clever & artistic. 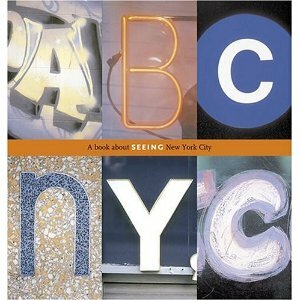 This stylish book is a great way for your child to learn his/her ABC's while highlighting their very own hometown. Furthermore, in what other city would "B" stand for bagel? LOVE. I am all for highlighting NYC!! Love how clever that book is, gotta have it! I just love my city! Thanks, Ellen! This book looks great. I am not from NYC but I love the idea. I am a new follower. I also love your banner/blog buttons. They are adorable.